To prepare the salad dressing, whisk the vinegar and sugar together in a small bowl, whisking until the sugar dissolves. Add all remaining ingredients, except the olive oil and seasonings, whisking dressing as you add each ingredient. add the oil very slowly, whisking well to emulsify the vinegar with the oil. Stir in thyme, salt amd pepper. Taste and adjust the seasonings. Cover and chill. 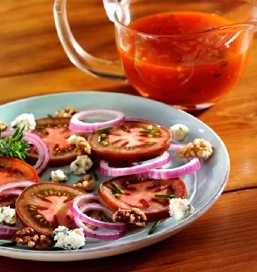 To prepare the salad, beging by placing Kumato® brand Tomatoes slices in a circular pattern around a luncheon or salad size plate, alternating each tomato slice with a red onion ring. Repeat with the remaining ingredients, circling around the plate. Drizzle tomatoes and onions with a small amount of dressing. Sprinkle the bleu cheese, spiced nuts and chives over the top of each salad. Drizzle with additional dressing. Serve immediately with additional dressing on the side.